Peel the sweet potatoes and cut them into large pieces. In a bowl, mix the olive oil, Classic Balsamic Cream, salt and pepper. Put the sweet potato pieces coated with this mixture in an oven-proof dish; bake in a pre-heated oven at 180oC for about 20 minutes. Heat the butter and sauté the carrots, cut into small pieces. Add the fennel, finely chopped, ginger, also finely chopped and turmeric (optional); sauté a while longer. Finally, add the roasted sweet potatoes and approximately one liter of stock. Add the coconut milk stir and simmer for a while over low heat. Add some salt (to taste). Prepare the onion rings. Cut the onion into rings; Dip the rings into the flour and grated parmesan mixture until they are all coated; deep fry in hot oil until golden. Lightly roast the pumpkin seeds until lightly golden brown. 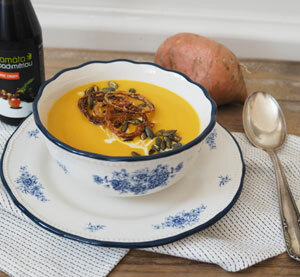 Serve the soup with the onion rings and the roasted pumpkin seeds. Tip: if you prefer a veloute, remove soup from heat and puree with an immersion blender, before adding the onion rings.